Robot class enables selenium to use an actual mouse, Actions class in selenium only simulates a mouse, which means Actions class does not move the mouse cursor. Selenium does not provide support to handle window based pop-ups (like download popups, upload popups). 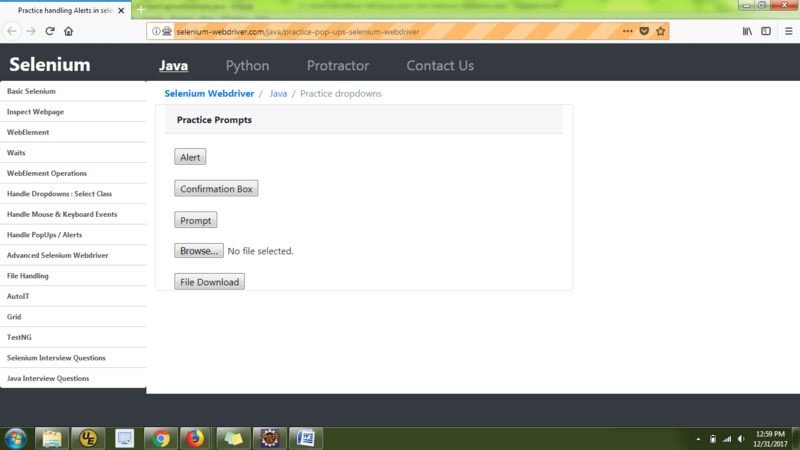 Robot Class used while we need to handle file upload and download activity using selenium webDriver. keyPress() : Presses a given key, The key should be released using the keyRelease method. If there is more than one key present in the keyboard for Key Code value( Like SHIFT, ALT, CTRL ) will map to the left key. keyRelease() : Releases a given keyboard key, if there is more than one key robot class considers the left key. mouseMove() : Moves mouse pointer to given screen coordinates, used long with Mouse Press most of the time. delay(ms) : Makes the robot action to sleep for the specified time. To catch any InterruptedExceptions that occur, Thread.sleep() may be used instead. 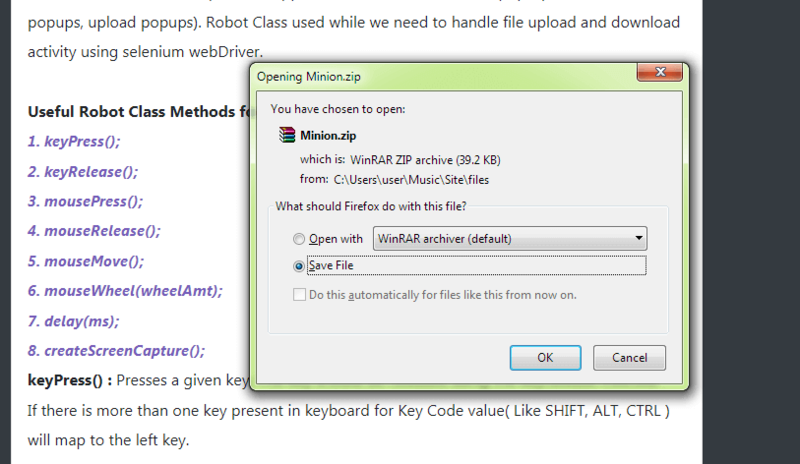 We can handle the download popup using Robot class, Just we have to press a couple of TABS and ENTER keys. Avoid using the mouse with the robot class when you cannot find the exact location of the buttons. Location of the button or the elements may change due to the size of the screen we have for testing. Example : Consider the Below download popup. Once the popup is active, check which element is in an active state. It takes two TABS to reach the Save File button. Once we reach the required button, press EnterKey. createScreenCapture Takes the screen shot of the given rectangle shape. This method accepts Rectangle type parameter. Robot class takes screenshot irrespective of application, if the application is minimized robot class takes a screenshot of the desktop. Full screenshot with Robot class in Selenium We can also take a full screenshot of the Desktop (any application which is active currently). Actions class simulates a mouse and keyboard, Robot class enables the actual mouse and keyboard, because of this reason you can see the movement of the mouse cursor. AutoIT follows .au3 extension to execute it we need to convert the Autoit script to a .exe file, In case of Robot class we do not have to package it, Robot class can be used along the java code itself. Robot class throws a few exceptions, we have to explicitly handle the exception with java. IllegalArgumentException - if the screen is not a screen GraphicsDevice. MouseMove method is specific to the dimension of the device screen size. Parallel running must be avoided as Robot class Executes actual mouse commands, so a computer cannot have two mice.